A Boutique for mermaids, this lovely shop is located in Merchant’s Square. The shop is reminiscent of time spent at the beach and has unique items to satisfy an inner mermaid of all ages. You will know you are in the right place by the wooden mermaids on the shutters and doors. Although the shop is small and quaint, there is an extensive variety of items to choose from, whether you are looking for a gift for a friend or a treat for yourself. There are mermaid soaps, sea glass soaps, mermaid ornaments, mermaid artwork, and night shirts for the Cape Cod Mermaid. The shop carries wonderful, whimsical art made from vintage post cards of mermaids, beautiful ceramic pieces with mermaids, framed mermaid art, and Leslie Evans lavender-filled pillows featuring stunning mermaid artwork. An insulated beach tote in ocean colors and patterns is just the thing for keeping water or your lunch cool for a day in the sun. They also carry a nice variety of Stonewall Kitchen yummies. There is a tremendous variety of jewelry in sea glass colors and some really beautiful fair trade necklaces made from recycled glass. Of the many unique items you will find, one of the cutest children’s items is the magnetic mermaid doll reminiscent of paper dolls from the 50’s and 60’s. The little mermaid clothes that come with the doll are magnetized to fit right on the mermaid. What little girl, or big girl for that matter, wouldn’t love to receive that gift? If you are visiting Cape Cod, you are sure to find something wonderful to take home that will be a reminder of your time spent here. From the Author: This is one of my favorite shops. It is one of those places that you happen upon and you want everything you see. Often hearing that comment from shoppers, the owner, Colleen, laughingly offers her "one of everything special." You will find the beautiful and the whimsical in this charming shop. If I need a gift for a girlfriend for one of my young nieces, I can always find something perfect for the occasion. Colleen, and her staff are welcoming and helpful. I love the wooden mermaids that are on the shutters outside the shop. They sell them but they are too large for where I wanted to use them. Colleen had them made in a smaller size for me and they are perfect. Once you visit this shop, you will go there often. 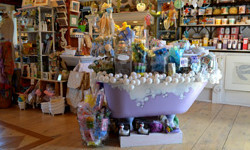 In the entrance of the shop is an old claw-foot bathtub filled with wonderful things for the land-locked mermaid's bath. In addition to their beautiful soaps and other items for a luxurious and fun filled bath, there are loofahs shaped like fish.